a BEAUTIFUL REEL. 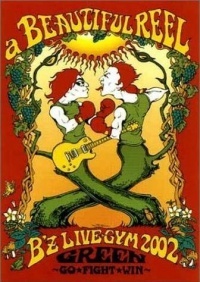 B'z LIVE-GYM 2002 GREEN ~GO★FIGHT★WIN~ is a home video by B'z, released on November 27, 2002. The release serves as a documentary film covering B'z LIVE-GYM 2002 "GREEN ~GO★FIGHT★WIN~", which toured in support of their twelfth album GREEN. The second disc contains backstage footage of B'z LIVE-GYM 2002 "Rock n' California Roll". With the exception of "Taiyou no Komachi Angel", this release contains the full setlist. This page was last modified on 21 March 2018, at 12:52.